A magnitude 8.1 earthquake has struck off the coast of Mexico this morning, a tremor strong enough and close enough to the coastline of the country that it puts the recently issued World Bank supported IBRD / FONDEN 2017 catastrophe bond at risk of being triggered. Update – sources suggest this cat bond could be a 100% loss. 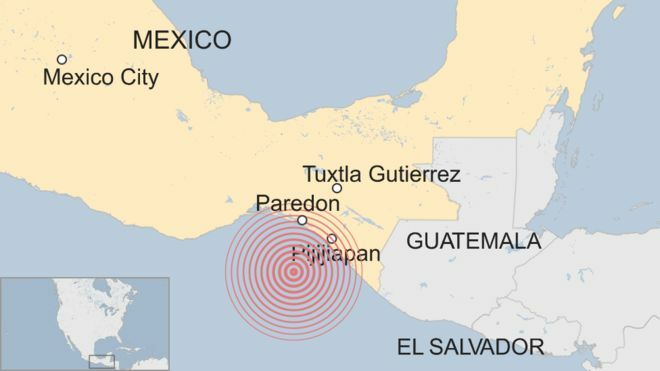 The epicentre of the magnitude 8.1 earthquake was around 100km (62 miles) south-west of the town of Pijijiapan, occurring around 35km deep, according to the United States Geological Survey. A tsunami warning has been issued for Mexico of waves up to 3 metres high, while waves of up to 1 metre are expected more widely in the region, possibly affecting Guatemala, El Salvador, Costa Rica, Nicaragua, Panama and Honduras. 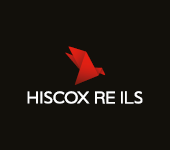 Insurance and reinsurance exposure is largely in major towns and cities of Mexico, so the coastal areas this earthquake will affect hardest may not result in a major loss. But the FONDEN 2017 cat bond is definitely at risk, as the earthquake has occurred in a location that could trigger it. 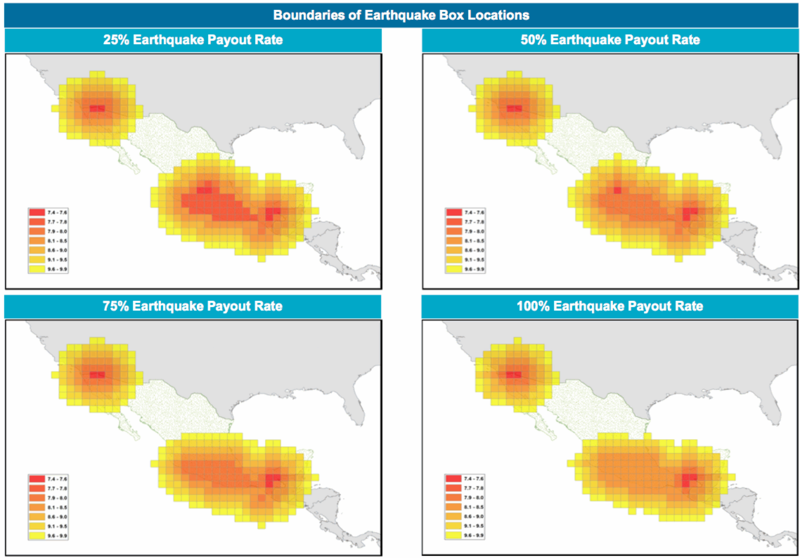 The location of the magnitude 8.0 earthquake looks as if it falls within the parametric box of the recent FONDEN 2017 catastrophe bond, that provides the Mexico government with a $360 million source of earthquake and named storm disaster insurance protection. The $150 million Capital-At-Risk Series 113 tranche of Class A notes issued in this FONDEN 2017 cat bond deal are exposed to earthquakes striking Mexico. The trigger is a parametric arrangement, with the cat bond paying out if an earthquake of a certain magnitude or higher occurs within the parametric boxes. A 25%, 50%, 75% and 100% payout of principal is possible, depending on the location and intensity of an earthquake. Now, look at the FONDEN 2017 parametric box arrangement, in the image below (shared with Artemis by a market source). It appears that the parametric box covers the area where this earthquake has occurred, but whether it will be triggered and payout its principal remains uncertain. So it looks like the earthquake has likely occurred within the parametric trigger box for the FONDEN 2017 catastrophe bond, putting the Class A notes at risk of a loss. Being magnitude 8.1 it looks as if a payout may be due, if the location is accurate and intensity unchanged, but it’s very difficult to say definitively whether that will be the case, or how much of the principal of the Class A tranche of notes is at risk of paying out. 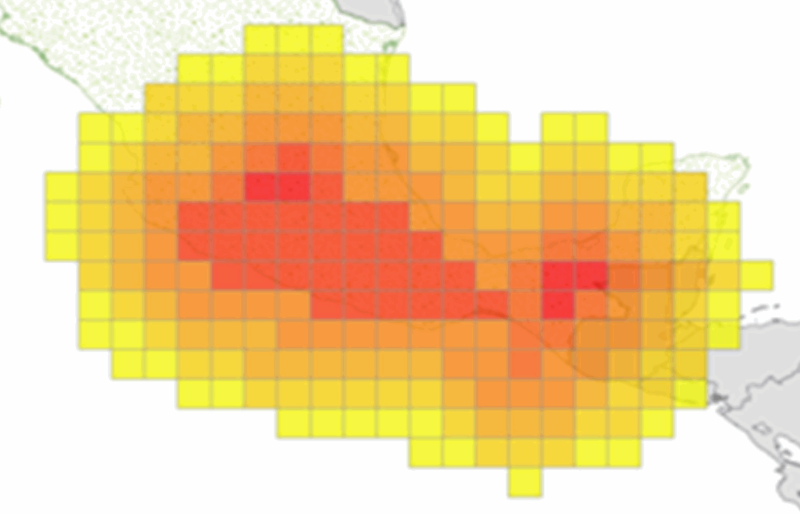 It will require the calculation agent to analyse the location and intensity of today’s Mexican earthquake before any determination over payouts can be made. But at this stage we can say that the earthquake is strong enough to trigger the FONDEN 2017 cat bond and it did occur within the parametric trigger zone, if and how much of the principal will be paid out cannot be said until the calculation agent has done its job. Overall, insurance and reinsurance losses from an earthquake in this region could be relatively low, hence the FONDEN 2017 catastrophe bond provides valuable disaster insurance that the Mexican government can use to aid recovery efforts. Hence a rapid determination of whether the notes have paid out is essential, which is why a parametric trigger has been used. Coming at a time when hurricane Irma is threatening numerous catastrophe bonds exposed to Florida named storms, another loss will of course not be welcomed by investors, but the transparency of a parametric trigger should allow certainty relatively quickly as long as the trigger has been well-designed. Market sources suggest that there is a good chance that the FONDEN 2017 catastrophe bond Class A notes are set to become a total loss. The parametric box that it appears the quake struck in would result in an 8.1 quake being a 100% loss of principal. If the magnitude was revised down to 8.0 it would be 50% we understand. The neighbouring boxes would still see an 8.1 magnitude quake as a 75% loss. So it appear a loss of principal is all but guaranteed, we do need to wait for the calculation report, how much just needs to be established.